Now Available for Immediate Download for Kindle! New Release by Tom Moates debuts at #1 on Amazon! In "Considering Horsemanship (Chapters One Through Five)," one of America’s most loved and devoted equestrian writers, Tom Moates, takes an all new approach to thinking about horsemanship. 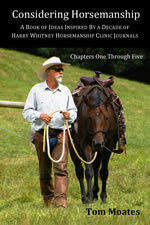 The subtitle sums it up: "A Book of Ideas Inspired By a Decade of Harry Whitney Horsemanship Clinic Journals." Moates revisits the tattered pages of notebooks kept from each of the Harry Whitney clinics he has attended across America and begins each chapter with a quote from his mentor. These sage remarks act as launching points into in depth discussions on the topic of horsemanship. This Kindle book contains the first five chapters offered for a modest price—similar installments will be published as Kindle books along the way and when the book has been completed it will be published in full print and e-book editions. Please visit Tom Moates' Facebook page. Tom Moates is a leading equestrian journalist and author. This award winning writer is on the masthead of Equus magazine as a Contributing Writer, and his articles run in many horse magazines in the United States and abroad including: Ranch & Reata, Eclectic-Horseman, America’s Horse, and Western Horseman. Moates’s newest book, Six Colts, Two Weeks, joins his other titles, Discovering Natural Horsemanship, A Horse’s Thought, Between the Reins, Further Along the Trail, Going Somewhere, and Passing It On, all established titles in the library of modern horsemanship literature. A compilation of his most notable articles and essays, Round-Up: A Gathering of Equine Writings, was published in 2011. 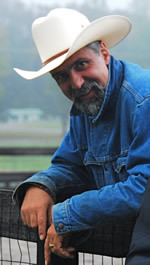 Moates lives on a solar powered farm with his wife Carol and a herd of horses in the Blue Ridge Mountains of Virginia. Book ordering info and Moates’s latest publishing news are available at www.TomMoates.com. There are miles of difference between journalists and writers, between reporting and telling a story. This is a sterling example of the latter. The writer here never gets in the way of what is a most engaging tale. The writer never succumbs to sensationalism or sentimentality, easy temptations with a subject of this nature. Word selection, pacing, organization--it's all here, beautiful in its simplicity, so much hard work appearing so effortless." From American Horse Publications: regarding Moates's award winning cover feature in Equus magazine, "A Cross-Country Ride Like No Other."